Home > Articles > Does High Protein equal Hyperactive Dog? This is something we come across on a regular basis. Many people visit our store and ask for a low protein diet for their dog because they are a little hyper but we have found that feeding a high protein diet calms dogs down. There are many reasons but this is what we have found. It all seems to depend on where the protein comes from and what quality. A dogs metabolism is different to that of a human. They firstly use protein and fat for energy but not carbohydrate. Carbohydrates are turned into fat so that they can be used for energy. This may be what causes spikes of hyperactive energy in your dog. Protein comes from many different sources including Muscle Meat, Wheat, Soya, Beaks, Hooves and Shoe Leather so its good to know what protein sources are in your dogs food. Low quality protein is harder for your dog to utilize and puts extra strain on the kidneys. Lets do a comparison of 2 foods. 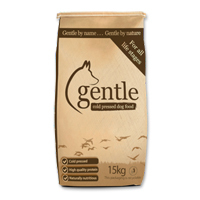 38% Protein, no cereals and a daily feeding guide of 160g for a 20kg dog providing 60.8g of protein from high quality meat sources. 19.5% Protein, lots of cereals and a daily feeding guide of 310g for a 20kg dog providing 60.45g of protein from ‘meat and animal derivatives’ and cereals. So the amount of protein given per day is almost identical but they come from very different sources. Hang on, that means that high protein doesn’t mean high protein- mind blown and myth busted! In recent years we have advised customers against using low protein diets to calm their dog and recommend high quality protein diets. The results have been amazing and we’ve even had customers who wouldn’t dare go above 21% protein in fear of a hyper dog but now feed over 30% protein with no problems. We also advise against feeding foods containing additives and colourants and have seen improvements in behavior. Pop into Taylors Petfoods and speak to one of our pet advisors about an appropriate diet for your dog.